Pressure cook the tovaram paruppu with 1/4 cup water for 2 whistles. Remove from the heat and allow it to cool. Drain the paruppu water and use it for rasam. Cooked paruppu can be mashed and used for preparing sambar or any other recipe. Soak tamarind & tomato in water for 30 mins. Heat oil in a kadhai and temper mustard seeds. Add curry leaves, dry red chilies, garlic flakes, black pepper powder and cumin powder. Add the paruppu water and turmeric powder. Add salt to taste. Let it boil and remove from the heat. Serve hot with steamed rice. 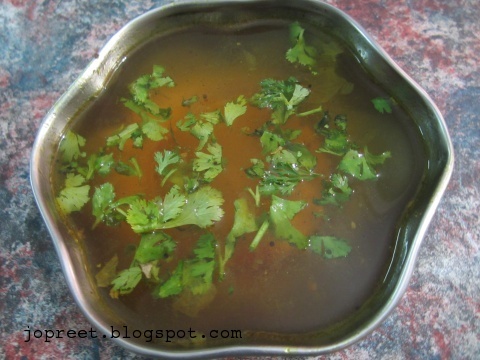 Rasam with rice..anytime for me…love it.